The recent climate disasters in the Caribbean call for creative and innovative approaches to building economic, environmental and social resilience. Increasingly constrained governments alone cannot solve these challenges. My work gives me the opportunity to experience first-hand the audacity of a new generation of creative entrepreneurs. These entrepreneurs are ready to take on our most pressing challenges. 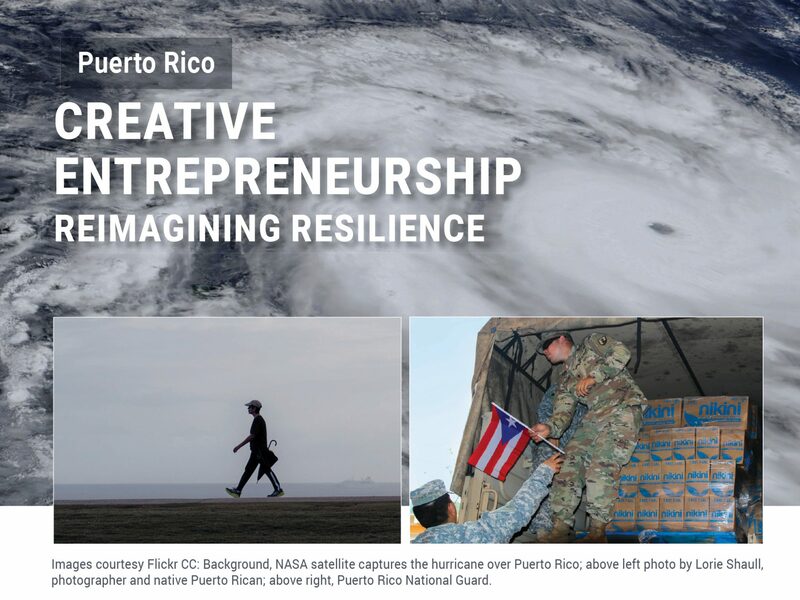 As co-founder of the initiative Puerto Rico Creative Economy, I’ve been working since 2011 to advocate about the importance of creative industries. These industries and strategic alliances are essential for economic development, education, research and social impact. 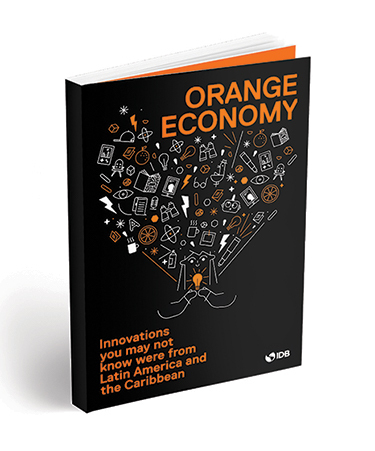 Orange Economy Innovations you may not know were from Latin America and the Carribean. Our work influences public policy, and in 2014 Puerto Rico made official its first Creative Industries Law. Most recently, in 2016-2017, I immersed myself in research into Latin American and the Caribbean in a collaboration with the Inter-American Development Bank in Washington D.C. We examined the positive role of creative entrepreneurship in solving big problems with big ideas on the region. This resulted in the publication that I co-authored, Orange Economy, which aims to shift the way we think about creativity in business and the impact that can be made by designing triple bottom line strategies which enable wealth creation and cultural thriving and produce positive returns for both society and environments. This is precisely where leadership and creativity can help to catalyze a new kind of sustainable prosperity. The story of disaster in Puerto Rico is a long one, beginning well before category five Hurricane María struck the small Island in 2017. It is rooted in the Island’s history, first as a Spanish colony and later on as an “unincorporated territory” of the United States as the Commonwealth of Puerto Rico. This sequence of events forced the country to develop amidst many political and economic constraints, the weight of which continues to loom over the nation in the form of a $73 billion debt. This article does not intend to examine this history. It focuses on the story of our people and our ability to reinvent ourselves using the resources that we have in abundance–our ideas and our creativity. Despite Puerto Rico’s crumbling political and economic stature, there are signs of progress. At its core Puerto Rico, a 100 by 35-mile territory of glorious landscapes. It has a population with strength and soul. Puerto Ricans possess an unlikely sense of pride and unity given the circumstances of our conflicted history. This can only be attributed to our very own culture, the strong traditions that have shaped us and the big heart and wittiness of our people. Beyond anything, Puerto Ricans foster resilience in the face of adversity. A reality passed down and perfected over many generations, it has surfaced again in the recovery process from this natural disaster. The aftermath of the hurricane massive damages to the electrical and built infrastructure, as well as land and flora. Over five months after the event, hundreds of thousands of people on the Island still live without electricity or without a roof over their heads. The statistics are heartbreaking. Of the 70,000 people who requested temporary plastic roofs in September, less than 25,000 had received them by December 2017. Electricity restoration rates continue to hover at 86%, and the Puerto Rico Department of Agriculture estimates that 80% of the crops were lost. How can we live better in the Caribbean, which besides its beauty and generosity for life, carries significant and surprising risks? How can we design its built environment to be better prepared for the next climate event? How can we design systems to be better prepared for an unexpected loss of electricity? 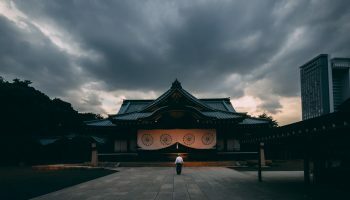 Many ground up initiatives attempting to answer these questions share one important common denominator – a capacity to think beyond emergency and use a moment in crisis to create opportunity for deeper transformation. 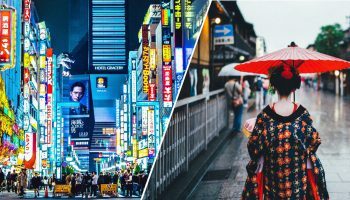 The list is as long and varied as the efforts themselves, but below are a few of the small and mighty efforts with the potential to move a country forward. Left: RPPR building energy resilience. Right: The Puerto Rico National Guard. Inset: Eco-Kit’s emergency relief item. Resilient Power Puerto Rico (RPPR) launched within hours following the hurricane as an effort to address the vulnerabilities of the island’s existing electricity infrastructure. 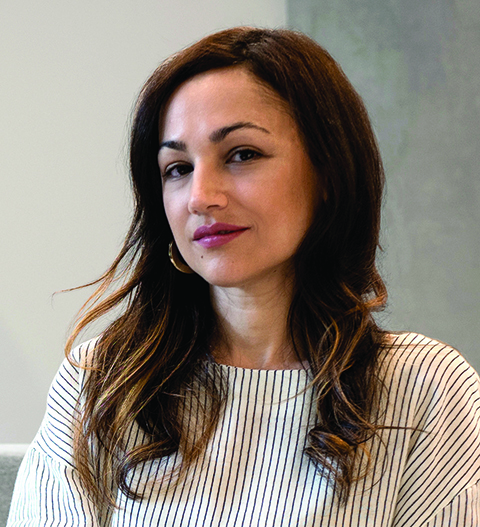 Co-founded by architects Jonathan Marvel, Cristina Roig-Morris, and Walter Meyer, along with Board Member José J. Terrasa-Soler, the team promotes solar and clean energy solutions for both immediate relief and long-term disaster-preparedness. In the critical days following the storm’s devastation, RPPR installed mobile solar-electric systems targeting the hardest-hit remote communities. Since then, the team works to deliver solar-electric kits to each municipality and create a cooperative model for community installation of solar hubs on central plazas. By 2021, the focus will be promoting solar electric energy to every household on the Island. 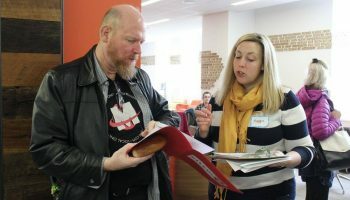 RPPR’s for-profit and non-profit operations model thrives on the interconnectedness of their own practice and the well-being of society at large. This comes with a deep sense of responsibility, ownership, and humility. As the RPPR team stated, “The post-Hurricane María experience has made us grow as individuals and professionals. It made us all rethink our role in Puerto Rican society, including the role we may play as architects. To understand the hidden connections and fundamental needs is key knowledge for any designer and these are only acquired through experience, sometimes overcoming extreme conditions that life may bring us.” RPPR’s long-term vision is to develop an island-wide workforce capable of growing the green economy and bringing a better quality of life to its people. Founded by sustainable designer and actress, Aris Mejías, along with artists and activists Yaraní del Valle, Isabel Gandía and Jeca Rodríguez Eco-Kit Puerto Rico offers a curated set of emergency relief items to empower individuals and grass-roots organizations in the recovery process. A guide accompanies tools, such as solar battery banks for recharging electric devices, manually chargeable radios, compact gas stoves, collapsible coolers, solar lamps, and manually chargeable flash lights to share valuable information about emergency preparedness in one central place. There is a larger sustainability vision behind the kit as well that hopes to inspire a larger movement. As Aris Mejías states, “Ever since I was a little girl, my parents made picking trash a part of our beach days. This principle greatly influences my work, as I try to mitigate the waste that relief efforts can generate in an already taxed environment on the Island.” Eco-Kit is helping Puerto Rico thrive again by turning into a long term educational platform with a local lens on topics like local weather-related emergency preparedness, waste mitigation, and environmental sustainability. Left to right: Agro-ecological movement in Puerto Ricoc. Images courtesy of El Departamento De La Comida. Now more than ever, we are in dire need of creativity and a good dose of imagination for innovative solutions to old and new challenges. Per Albert Einstein’s famous words, “We cannot solve problems by using the same kind of thinking we used to create them.” Innovation may seem like a grandiose concept, but it is simply about changing what is not working and proposing new ways of doing things. It starts with every one of us and our individual impetus to thrive. In Puerto Rico, these change-makers are proving how new models of value creation and thriving are possible. I bet on them, and the awakening of civil society to continue a movement of ideas that will allow us to recover with resilience for the long term. Creativity is our unlimited resource to make that happen. Design beyond emergency. Use a moment in crisis to catalyze community agency and create collective opportunity for deeper transformation. >> LEAD to enable others to develop agency and ability. >> CREATE tools that can be shared and used, and re-shared and re-used. De Jesús is a creative strategy consultant with two decades of experience ranging from business development and innovation to creative services. Her work is rooted in a triple bottom line approach, equally considering social, cultural, and environmental factors in business. An advocate for the purpose and creative economies as key contributors to sustainable prosperity.